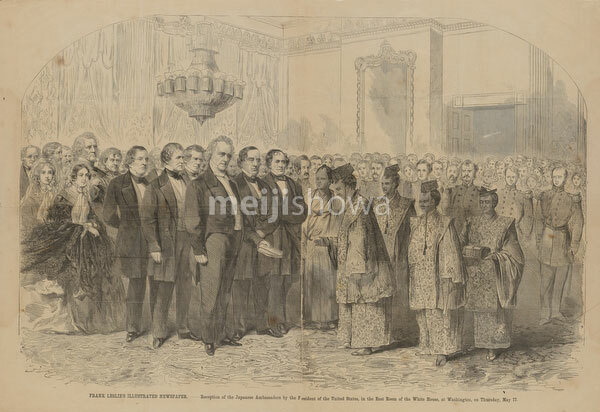 Engraving from Frank Leslie’s Illustrated Newspaper showing US President James Buchanan meeting members of the Japanese Embassy to the United States (万延元年遣米使節) at the White House in Washington, on Thursday May 17, 1860 (Mannen 1). Dispatched by the Tokugawa shogunate on January 19, it was Japan’s first diplomatic mission to the United States. The party returned on November 8. The group of 96 Japanese men and one American officer included Ambassador Shinmi Masaoki (新見豊前守正興), Vice-Ambassador Muragaki Norimasa (村垣淡路守範正), and Observer Oguri Tadamasa (小栗豊後守忠順).